It was shortly after we signed on as a customer of Techrigy’s SM2 last year that we heard about Alterian’s acquisition of the social media tools company. Now, our company, Intrepid, has just been acquired by Alterian as well. Obviously, I applaud Alterian’s vision. Together, we will be able to provide a very compelling solution around social media intelligence. The growth in the adoption of social media has been astounding, yet we’re still just in the beginning stages. Social data is growing exponentially, and buried in it are gold mines of insights. I believe getting at them properly requires both a robust platform as well as good human effort. Alterian offers a world-class integrated marketing platform. Intrepid offers services that provide insights around social data. Together, we extend each other’s reach and complement one another’s strengths. Alterian customers and partners now will have accessible support around how to use social data. Our analysts can do the digging of the data that uncovers the gold mine of actionable insights. As part of our integrated launch plan, Alterian has prepared service packages that will immediately add value to those deploying Atlerian’s SM2. Once customers and partners understand what and how to ask compelling marketing and research questions around social data, the platform will become much more valuable. I’m confident that our social media expertise will be a welcomed augmentation to Alterian’s marketing platform for both customers and partners. For Intrepid, we now have a solid marketing platform behind us. This allows us to be a legitimate player in coming up with over-arching social intelligence solutions that are more efficient and eloquent. Alterian’s global reach really offers a tremendous opportunity for all of us to push thought-leadership in social data solutions across different markets. It’s still a brave new world in terms of social media intelligence. 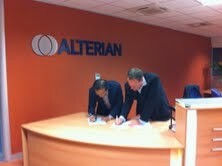 And I’m very excited to have joined forces with Alterian to make our impact. 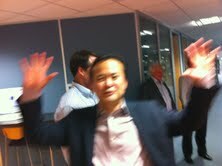 Posted in Company building and tagged Alterian, Intrepid, John Song, M&A, social media. Bookmark the permalink. 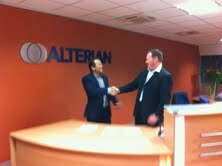 We welcome you & your team to the Alterian family! To date it’s been great, but let’s make it better!